I opened Dolce Italia with the dream of creating a little gathering place to enjoy good food and good company. You, my patrons, have helped me to create my dream! I wish to thank you by providing my very best in hospitality, ambiance and flavor. 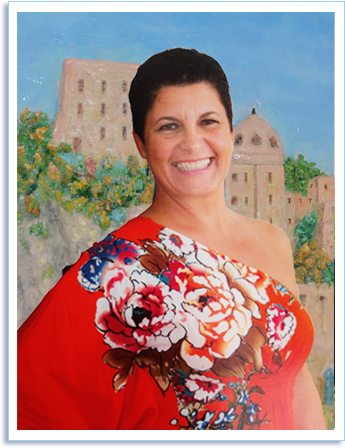 I came here from Ischia, Italy to share my passion for creating wholesome Italian Cuisine from my family traditions. In return, you have made me feel like a part of a big happy family here, so I don’t miss my country so much. My father created the sculpture of the enchanted Castle Aragonese on my wall to remind me of the beautiful place where I was born and raised. Over the past years, my dreams have come true. I remember each of our customers with fondness, I enjoy every evening that you spend with us at Dolce Italia, and I feel very lucky to have such a wonderful family of patrons. “La Nostra Casa e la Vostra Casa.” — Our Home is Your Home. Tiziana & The Dolce Italia Family!